I realized this morning, in my attempt to remain apolitical, I may give the impression the Adirondack Lifestyle involves living under a rock. I've avoided the topic of NY's 23rd Congressional race because I didn't want to bore the reader with local politics. I did not realize the election would draw such wide national interest. I can't turn on a Tee-Vee or radio news station, or read a real newspaper without seeing my neighbor, Doug Hoffman's name. Although I can't vote because Lake Placid is NOT in the 23rd district, I am indeed following the election process with a keen interest. The latest news is the official Republican candidate, Dede Scozzafava, has dropped her bid and the Republican leaders have endorsed Doug Hoffman, and Sarah Palin may visit this hockey hot-spot. That, by the way, is Captain Old News news since the Adirondacks are crawling with reporters and bloggers who can seriously scoop me because they do nothing else but report on this topic. Although I can't compete with the pros on scoops, I can offer the Adirondack Lifestyle spin on things. For example, I couldn't help but shudder a little when I clicked on my standard Sunday morning read, Frank Rich's Op-ed column in the NY Times. I knew I'd be seeing the 23rd district mentioned when I saw the headline: "The G.O.P. Stalinists Invade Upstate New York." It turns out, Rich's article has some good links to background on the story for those of you who haven't been following, but more importantly, the man obviously knows the Adirondacks. He used the phrase "alternative universe" in reference to the current shenanigans being observed in the 23rd district. I know Rich gets it because I have always felt like the Adirondacks are an alternative universe. Back in the day when I was being introduced to upstate New York politics, an old-timer referenced the "Lake Placid Syndrome," which was the name Albany workers had for Lake Placidons who functioned as if Lake Placid is the center of the universe. My response was then, and still is, "Yes they do, and it certainly is an alternative universe." 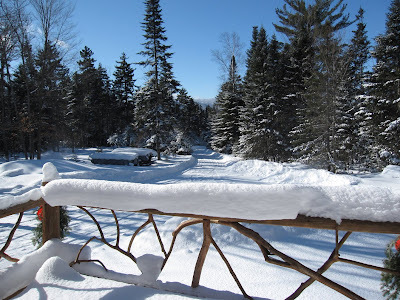 Today's featured photo is today's view from home in my alternative Adirondack universe.